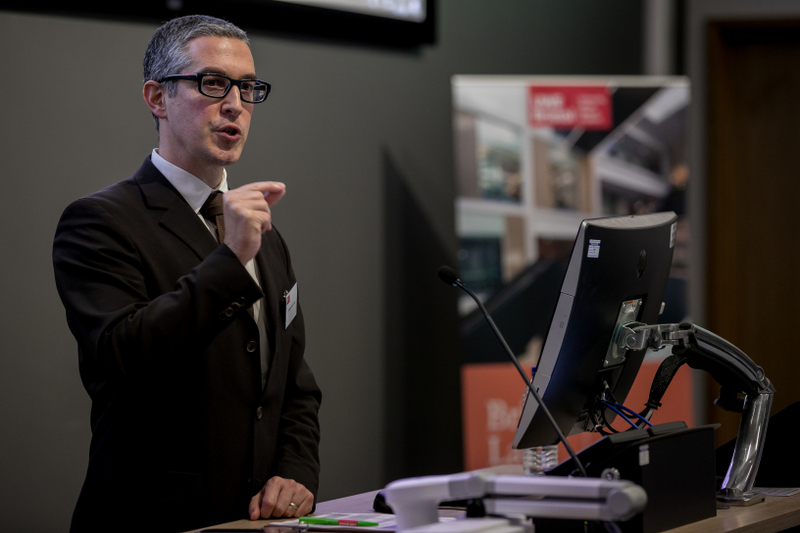 On 30 November 2017 the Bristol Law School welcomed Laurent Pech, Professor of European Law and holder of the Jean Monnet Chair of EU Public Law at Middlesex University London. The title of his Distinguished Professorial Address was ‘Rule of Law Backsliding in the European Union: Lessons from Hungary and Poland’, a topic on which Professor Pech has extensively written. Professor Pech began his Address by explaining that it was a rather depressing topic to address and that he had unfortunately no good news to share. In his opinion the situation in Hungary and Poland represents a clear and present threat to the very functioning of the EU legal order even more than the withdrawal of the UK from the European Union. Using data from the NGO Freedom House Prof Pech pointed at the declining situation of the rule of law in Hungary and more recently Poland which had adopted a series of measures leading to an even faster process of rule of law backsliding in this country. Prof Pech took this opportunity to stress that rule of law problems were not only visible in Hungary and Poland but in a number of EU Member States. However given the systemic, repeated and deliberate nature of the attacks on the rule of law in these two countries the focus of his lecture was going to be on these two States. As Prof Pech explained, the rule of law situation in a specific State is only scrutinised during the enlargement process but no general and permanent system was initially designed to look at backsliding whilst being a Member State of the European Union. That being said, he clarified that, unbeknownst to many, Romania and Bulgaria have been subject to a specific rule of law monitoring system following their accession. The fact that the rule of law situation is getting worse in Romania in spite of the monitoring system tends to show that the system is not as robust as it should be. Yet, as Prof Pech noted, the situation in Romania has not reached the levels seen in Hungary and Poland. By ‘backsliding’ Prof Pech means that a State is on a downward spiral, from a healthy to an unhealthy system of the rule of law. Whilst this started in 2010 in Hungary, the ‘disease’, as Prof Pech called it, is spreading to other Eastern European States and it seems that it is not going to disappear in the nearest future. Continuing the medical analogy, Prof Pech expressed his concern that the European Union was struggling to find ‘a cure to the disease’ having previously struggled to correctly diagnose the disease beforehand. The definition of rule of law backsliding proposed by Prof Pech is that it is ‘a process through which (1) elected public authorities deliberately implement governmental blueprints which (2) aim to systematically weaken, annihilate or capture internal checks on power with (3) the view of dismantling the liberal democratic state and entrenching the long-term rule of the dominant party’ (see Pech and Scheppele, ‘Illiberalism Within: Rule of Law Backsliding in the EU’ (2017) 19 Cambridge Yearbook of European Legal Studies 3). In other words, rule of law backsliding implies a deliberate governmental plan to systematically annihilate the rule of law and which tends to start with attacks on the independence of the judiciary. It is this specific intent to dismantle systematically all checks and balances with the view of establishing a de facto one-party state that distinguishes the situation in Poland and Hungary from that in other EU Member States such as Italy where structural rule of law deficiencies may be identified. Remarkably, the argument of the ‘will of the people’ is now more and more used by governments to justify new limits if not new attacks on the rule of law. In the long term, the goal is to reshape the rules so that even if elections are held they will lead to the current government to be reconducted in its mandate as usual checks and balances measures have disappeared and elections may be free but are no longer fair. Prof Pech then explained that in the aforementioned journal article he and his colleague Prof Scheppele provide a matrix of ‘constitutional capture’ in seven steps to help understand what has happened in Hungary but also in a number of non EU countries. In short, it is a recipe to destroy the rule of law in a methodological manner. According to Prof Pech Poland has now reached stage 4 whilst Hungary is in stage 7. Whilst it might be too late to rescue Hungary the question is whether the European Union will be able to prevent Poland from sliding further. Unfortunately ‘worst practices’ travel fast too and the domino effect might hit us earlier and quicker than anticipated. In 2010 Hungary showed the first signs of backsliding by requiring all judges above a certain age to retire. The European Commission replied by using its infringement powers but it was too late. Following a CJEU ruling requiring Hungary to offer adequate remedies, most ‘retired’ judges accepted financial compensation and were thus replaced by ideologically compatible judges. Hungary then played the EU to its own game and adopted a law strengthening the position of these judges, arguing that it was doing so to uphold the rule of law. So, as Prof Pech stated, although the Commission had won the ‘battle’ before the CJEU it had lost the rule of law ‘war’. The Commission drew its own conclusions: it needed a new instrument to tackle the problem. In 2014 the Rule of Law Framework was adopted and in 2016 it was used in relation to the situation in Poland. The problem with the Rule of Law Framework according to Prof Pech is that it relies on a discursive approach. In his view, however, a dialogue with autocrats does not work; it tends in fact to be nothing more than a monologue. Moreover, to foster an environment conducive to a dialogue the Commission has until recently refrained from initiating multiple infringement procedures while also failing to react to the Polish government’s provocations and its complete disregard for its multiple rule of law recommendations. Whilst the Commission can be seen to be at least trying to address the issue, the Council of Ministers has so far been reluctant to publicly denounce the situation in Hungary and Poland. To some extent its actions (or lack thereof) can be regarded has having undermined the work of the Commission. What is more, some EU Member States have for example sided with Poland, thus making it difficult to exert pressure on Poland. In contrast, the European Parliament has been quite active by adopting a series of resolutions denouncing the situation in Hungary and Poland but as such resolutions are not legally binding and have had little immediate effect. Recently, the European Parliament has asked for the procedures mentioned in Article 7 of the Treaty on European Union to be triggered with regard to Hungary and Poland. Professor Pech emphasised that this procedure is wrongly labelled as ‘nuclear option’, for a nuclear option can only be used when it is too late, in which case this begs the question: ‘why use it at all?’. Article 7 TEU contains two mechanisms to ensure that the rule of law and fundamental rights are complied with: a preventive one (paragraph 1) and a sanctioning (paragraphs 2-3) mechanism. On the day of his presentation Professor Pech mentioned that the European Commission was currently considering the possibility to recommend the initiation of the preventive mechanism (which was in fact activated on 20 December 2017). Professor Pech explained that the problem with the sanctioning mechanism is that it can only be triggered by unanimity (minus the State that is being ‘investigated’) but given that there are several States that are failing to comply with the rule of law requirements other non-compliant States could be expected to veto any possibility to eventually adopt sanctions against the state subject to Article 7(2). Professor Pech then argued rather contentiously that Article 7 TEU might not be the ‘real’ nuclear option. Worse repercussions than the suspension of eg voting rights would come from the CJEU declining to consider Polish courts as courts within the meaning of EU law on the basis that such courts are no longer independent. The possible ramifications of such a decision could be potentially considerable. What can be done? According to Prof Pech it is time to use every single tool available! Everything the European Union can do to tackle the problem, it should do it and it should do it now! In his opinion, the situation in Hungary and Poland is more worrying than Brexit. At this stage Prof Pech drew some parallels between the rule of law situations in the UK on the one hand and in Poland and Hungary on the other. Indeed he argued that the first signs of an unhealthy rhetoric in the UK could be seen too. Sadly it seems that judges and academics are increasingly subject to abuse and intimidation tactics. The attack on the judiciary in the wake of the Miller case and the ‘enemies of the people’ headline in the Daily Mail is a hallmark of autocratic regimes as a healthy judicial system enables individuals to use legal avenues to vindicate their rights. Similarly attacks on ‘pro-remain’ universities is another way to ensure that a counter, in the case of the UK anti-Brexit, discourse is muted. No voices are thus left to proffer arguments against governmental policies which some may be tempted to justify in the name of ‘the will of the people’ regardless of whether they violate the rule of law or not. A third parallel is the attack against George Soros and his foundation, both in Hungary as well as in the UK as Nigel Farage sought to investigate Soros funding. The anti-Semitic overtones of the anti-Soros rhetoric can be viewed as an attempt to garner the support of autocratic and nativist forces. Despite all these shared traits, Prof Pech emphasised that the UK legal and constitutional system should be strong enough to withstand criticism towards the judiciary and that British universities can do that too. There is no need yet to be excessively worried about the situation though some of the rhetoric used by pro-Brexit supporters is similar to the one used by autocratic regimes in the world. In particular, Prof Pech explained that the ‘will of the people’ appeal is often used as a way to justify violations of the rule of law. Prof Pech finished his Address by stressing that it was important to ‘diagnose the disease’ so as to be able to provide an appropriate remedy and that the number 1 priority of the European Union should be to tackle rule of law backsliding in its own backyard and stop procrastinating about it.